The Simpsons' ninth season originally aired on the Fox network between September 1997 and May 1998, beginning on Sunday, September 21, 1997, with "The City of New York vs. Homer Simpson". With Mike Scully as showrunner for the ninth production season, the aired season contained three episodes which were hold-over episodes from season eight, which Bill Oakley and Josh Weinstein ran. It also contained two episodes which were run by David Mirkin, and another two hold-over episodes which were run by Al Jean and Mike Reiss. Season nine won three Emmy Awards: "Trash of the Titans" for Primetime Emmy Award for Outstanding Animated Program (for Programming Less Than One Hour) in 1998, Hank Azaria won "Outstanding Voice-Over Performance" for the voice of Apu Nahasapeemapetilon, and Alf Clausen and Ken Keeler won the "Outstanding Music and Lyrics" award. Clausen was also nominated for "Outstanding Music Direction" and "Outstanding Music Composition for a Series (Dramatic Underscore)" for "Treehouse of Horror VIII". Season nine was also nominated for a "Best Network Television Series" award by the Saturn Awards and "Best Sound Editing" for a Golden Reel Award. The Simpsons 9th Season DVD was released on December 19, 2006 in Region 1, January 29, 2007 in Region 2 and March 21, 2007 in Region 4. The DVD was released in two different forms: a Lisa-shaped head, to match the Maggie, Homer and Marge shaped heads from the three previous DVD sets, and also a standard rectangular shaped box. Like the previous DVD sets, both versions are available for sale separately. Note: First appearance of Duffman. When a celebration is held at Springfield Elementary to honor his 20 years as principal, Principal Skinner is revealed to be an impostor when the real Principal, Sgt. Principal Skinner, shows up. The principal's real name is revealed to be Armin Tamzarian, an orphan from Capital City. Armin soon leaves to return to Capital City, and Sgt. Principal Skinner takes over as principal. However, many, including Agnes Skinner, soon decide they preferred the old Seymour. After persuading him to come back from Capital City to be Principal Skinner again, the townspeople send Sgt. Skinner out of town on a railroad. After being disrupted by Lisa's saxophone practice, Bart gets into a fight with Lisa, ultimately causing her saxophone to be thrown out the window and run over by a Woolworth's truck, flattening it. Lisa is depressed when her sax is flattened. Trying to console her, Homer shares the story of how she got her saxophone. After finishing the story, Homer once again decides to not spend the money on an air conditioner and buys a new saxophone for Lisa instead. After a large soccer riot leads to an extended period of mob rule throughout Springfield, Homer decides to forgo an expensive security system in favor of a gun. As Marge disapproves of a gun in the house, Homer takes her to an NRA meeting to sell her on the concept. Marge's objections continue, finally forcing Homer to agree to get rid of the weapon. Bart and Milhouse later discover it concealed in the refrigerator. Infuriated and frightened, Marge takes the kids and leaves Homer. With nothing but his gun and his indignation for company, Homer hosts an NRA meeting in his empty house, only to be kicked out of the group when the members themselves acknowledge his reckless and irresponsible treatment of firearms. Thus humbled, Homer seeks out his family to admit his mistake. Guest star: Joe Namath, Roy Firestone & Mike Judge. Guest star: Jan Hooks & Andrea Martin. Guest star: Stephen Jay Gould. Homer takes Marge to a police-seized property auction, where he buys a Lil' Bandit. On the ride home, Marge decides to walk because of Homer's erratic driving in the new car. She runs into Lionel Hutz, who is now a realtor. Interested, Marge takes a test to become one, and soon works for a realtor company, Red Blazer Realty. However, after being threatened to be fired for failing to sell any houses, Marge must lie to the Flanders to sell them a house where murders had once taken place. Feeling guilty, Marge tells them the truth after they stay there for a night, which only seems to make them more fascinated in living in the home. Meanwhile, Snake hears about the auction of his car and is so angry that he breaks out of jail to get it back. As he and Homer fight at the power plant, the car crashes into the house, causing the Flanders to move back to their home, and Marge to get fired. On Christmas morning, Bart wakes up earlier than the rest of the family and goes to open his presents. After playing with a remote control firetruck, Bart accidentally starts a fire, causing the plastic Christmas tree and the presents to melt. Bart hides the melted mess, but when the rest of the Simpson family wakes up ,Bart reports to the family that there had been a robber. The news media soon reports this, and the community rallies to their aid and donates $15,000, which Homer spends on a car he soon crashes. However, Bart soon tells the truth to his family; that there never was a robber. The community soon finds out, and demands their money back. Marge decides to go on Jeopardy! to make the money back, but does not succeed. When the family comes back home, they find that the town has looted their entire house of everything except a washcloth. While the family is at a traveling carnival, Bart accidentally crashes Adolf Hitler's car. To pay off the debts, Homer and Bart get jobs at the carnival by helping with the booths and exhibits, where they befriend Cooder and Spud, a father-and-son carny team. Homer causes their booth to get shut down, when he does not recognize the bribe Chief Wiggum was asking for. Homer decides to allow the two carnies to stay at his home. The next day, the family goes to a glass bottom boat ride with the tickets Cooder gave them, only to discover their house has been taken over by the two carnies when they return. After brainstorming on how to get the house back, Homer decides to make Cooder a deal: If Homer can get a hula hoop around the house's chimney, he can have his house back, but if he does not, he will sign the deed of the house to Cooder. However, the family fool the two carnies, and rush back into the house before the two can do anything. As the students of Springfield Elementary are being driven to a model UN conference, Otto drives the bus off a bridge after his brake pedal is blocked by a grapefruit. To obtain help, Otto swims off, while the kids are still in the bus. Soon, when the bus is nearly full of water, the kids manage to escape and swim to an island. Once there, the kids find no food, causing Bart to swim back to the sunken bus to get the cooler full of food. Lisa advises everyone to not eat much, as it may be the only food they could have for some time. However, the cooler is found empty the next morning, with the food wrappings discarded around Milhouse, who claims a monster ate it. Lisa champions the charter of the Model UN and insists on giving Milhouse a trial, wherein he is found innocent. The verdict angers the kids, however, inciting violence against Martin, Milhouse, and Bart, who are forced to flee. The three hide in a cave, but are chased out by a boar, which is soon found out to be the "monster". The kids kill the boar and eat it, and a narration assures that Moe saves the kids. Meanwhile, Homer starts his own internet company, but it is eventually destroyed by Bill Gates. Guest star: James Earl Jones. Guest star: Jay Leno, Janeane Garofalo, Bobcat Goldthwait, Hank Williams Jr., Steven Wright & Bruce Baum. After several unsuccessful attempts at getting a girlfriend, Moe finally gets one after walking away from a disco with Homer. The woman, Renee, surprisingly finds Moe attractive, resulting in Moe treating her lavishly. After spending too much, Moe's credit card maxes out, causing him to become desperate for money. He soon devises a plan to have Homer steal his car and crash it to accomplish insurance fraud. Homer gets caught and ends up in jail. With the insurance money, Moe decides not to bail Homer out of jail, but instead take a Hawaiian vacation with Renee. After finding out, Homer escapes and decides to find Moe for revenge. Meanwhile, Moe confesses the truth to Renee, who is happy at first, but is disgusted with him after his plans to free Homer involve lying again. Renee leaves Moe, then he accidentally starts a fire at his tavern. At the same time, Homer comes to fight Moe, but both faint from smoke inhalation. Finally, Barney comes and saves the two, and Homer allows Moe to temporarily run his bar at the Simpsons' house. Soon after being unable to solve a brain-teaser that several others at school were able to solve, and forgetting some of her day to day tasks, Lisa learns from Grampa that the Simpsons have a long history of losing their intelligence in late childhood. Lisa soon realizes that she cannot escape genetics, and accepts that she will soon be very unintelligent. After realizing the importance of sharing what you can with the world while you still have the chance, she lies her way onto a news broadcast to deliver a message on treasuring your brain. Homer sees this and, upon learning what Abe told her, attempts to disprove the theory of the "Simpson gene" by gathering every Simpson in the area together to showcase their merits. It is quickly apparent that Homer did not research this project much, as many of his guests prove to be simpletons, deadbeats, and stooges. Lisa's salvation only comes when she begins to meet the Simpson women, including a doctor who then informs Lisa that the defective "Simpson gene" is located only on the Y-chromosome. Re-validated, Lisa celebrates that she is once again herself, an event aptly crowned when she finally manages to solve the brain-teaser that so plagued her. Meanwhile, Apu finds out that Jasper has locked himself inside a freezer at the Kwik-E-Mart and decides to turn it into a freak house. When Marge realizes that Ralph Wiggum has no friends, she volunteers Bart to be his friend. Initially unwilling, Bart discovers that Ralph's father, Chief Wiggum, owns a key that opens every lock in Springfield. The two go out at night and open many places to have fun, but soon encounter bullies Nelson, Dolph, Jimbo, and Kearney. The four pressure Bart and Ralph to sneak into an abandoned prison, but Bart decides not to when he sees that Ralph is scared. The key is thrown over into the prison by the trouble-makers, causing Bart and Ralph to go retrieve it. While in the prison, the two find an old electric chair, which they turn on to see if it still works, and later go home. The next day, Mayor Quimby announces the prison is reopened, and decides to demonstrate what criminals could face by sitting in the, unknown to the police and the mayor, active chair. Bart rushes to Ralph for help to tell the mayor that the chair is active, leading Lisa to fire a small rocket with a note attached to the prison. The rocket misses and crashes into the power plant. Mr. Burns responds and, upon realizing the prison has been using free electricity, turns off the power, saving the mayor. Homer is fired from the Nuclear Power Plant following a near meltdown, and decides to join the Naval Reserve. Meanwhile, Bart decides to get an earring. Homer graduates from basic training, and must go off on a mission of war games, but not before taking Bart's earring, which he disapproves of. Later, on the submarine, Homer befriends the Captain, who leaves him in charge when he goes to check a blocked torpedo. Homer believes the ship is being fired at, and launches a torpedo, accidentally ejecting the Captain. Homer eventually gets the submarine lost, and is considered a traitor by the media. The United States Navy fires at the submarine, causing a leak which Homer stops with Bart's earring. The submarine is soon surfaced, and Homer is taken into custody by the Navy. However, he escapes any trouble due to the Navy judges having to resign over various scandals that they are involved in. Homer then leaves the Navy with a dishonorable discharge. Guest star: Bob Denver & Rod Steiger. Forgetting to do his annual income taxes until the night they are due, Homer rushes to fill out his forms with false information. Soon after, he is arrested for tax fraud, but makes a deal to work for the FBI for immunity from the IRS's prosecutions. After a successful operation made by Homer, the FBI decides to have Homer obtain a one trillion dollar bill that is in the hands of Montgomery Burns. Homer leads Mr. Burns to believe that he is a reporter, causing Mr. Burns to show him the bill. The FBI rushes into the mansion and arrests Mr. Burns, but Homer decides to rescue him. Mr. Burns gets the help of Waylon Smithers, and with Homer, the three escape in Mr. Burns' plane. Looking for an island to buy, Mr. Burns decides to land in Cuba, where the three meet Fidel Castro. Castro does not wish to sell Cuba, but is interested in seeing the trillion dollar bill. However, after he is handed the bill, he decides to not return it. The show ends with the three on a raft back to the United States. Bart becomes disappointed with his father after he fails miserably in a game of Capture the Flag. Thus shamed, Homer decides to go to a gym every night to exercise, while eating an energy bar called "Powersauce" and being trained by Rainier Wolfcastle. In time Homer develops quite the impressive build, so much so that when Wolfcastle refuses two Powersauce representatives when they ask him to climb Springfield's tallest mountain, the Murderhorn, Homer is the one to take over this publicity stunt. To make sure Homer gets to the top, the company hires two Sherpas to drag Homer up the mountain during the night. However, Homer soon realizes the Sherpas are doing this, and fires them so that he can climb solo. After much climbing, Homer believes he has finally made it to the top, but then sees that he has only made it to a plateau of the mountain. Feeling that he cannot climb any higher, Homer places a flag where he is. This creates a crack which breaks the top of the mountain off, making the plateau where Homer is standing become the peak. After climbing back down, Bart shows that he is proud of his father again. Guest star: Brendan Fraser & Steven Weber. When Bart comes home with some novelty items superglued to his face, Marge takes him to the emergency room, spoiling Lisa's chance to go the Springfield Museum to catch the last day of the Isis Exhibit. Marge forbids Lisa to take public transportation to the museum by herself, but Lisa is able to manipulate her father for his permission to take the bus. However, Lisa takes the wrong bus and ends up in the middle of nowhere. Meanwhile, Homer realizes that he should not have given Lisa permission to take the bus by herself. He rushes to the museum to find her, but she has managed to get downtown after much travel. Near the museum, Homer decides to use a cherry picker to locate Lisa, but the cherry picker loses control and falls into the pier, and floats off to a drawbridge. Lisa sees this, and quickly tells the bridge operator to lower the bridge, which catches Homer by his head to save him. The exhibit is closed, but Homer promises to break into the museum at night with Lisa, where the two discover one of the exhibits' objects is a musical box. In terms of households, the show ranked just outside the Top 30, coming in at #32 with a 9.3 household rating and a 15 percent audience share. However, in terms of total viewers, the show ranked within the Top 20, coming in at #17 for the season, (tying with Dateline Tuesday) and being watched by an average of 15.3 million viewers per episode. The DVD boxset for season nine was released by 20th Century Fox in the United States and Canada on December 19, 2006, eight years after it had completed broadcast on television. As well as every episode from the season, the DVD release features bonus material including deleted scenes, animatics, and commentaries for every episode. As with the two preceding seasons, the set was released in two different packagings: A "Collector's Edition" plastic packaging molded to look like Lisa's head, and a standard rectangular cardboard box featuring Lisa with a backstage pass to a show at a club. The menus continue the same format from the previous four seasons, and the overall theme is various characters waiting in line at a club. Animation Showcase: "The Principal and the Pauper" and "Lisa the Simpson"
Illustrated commentary: "All Singing, All Dancing" and "Lost Our Lisa"
Gimple, Scott (1999). The Simpsons Forever! : A Complete Guide to Our Favorite Family ...Continued. Harper Collins Publishers. ISBN 0-06-098763-4. ^ a b "1997-1998 Emmy Awards". infoplease.com. Retrieved 2006-09-25. ^ "1997-1998 Emmy Awards". emmy.org. Archived from the original on February 15, 2011. Retrieved 2006-09-25. ^ a b "Every show, every winner, every nominee". The Envelope. Retrieved 2006-09-25. ^ Associated Press (September 25, 1997). "NBC lands on top; new season starts". Sun-Sentinel. p. 4E. ^ "Nielsen ratings" (PDF). USA Today. Gannett Company. 1997-10-01. p. D3. Retrieved 2014-03-10. ^ "Nielsen ratings" (PDF). USA Today. Gannett Company. 1997-10-22. p. D3. Retrieved 2014-03-10. ^ Bauder, David (October 31, 1997). "Strongs series finish boosts NBC". Rocky Mountain News. p. 11D. ^ Associated Press (November 6, 1997). "'Cinderella' works magic for ABC". Sun-Sentinel. p. 4E. ^ Associated Press (November 13, 1997). "CBS soars to top on 'angel' wings". Sun-Sentinel. p. 4E. ^ Associated Press (November 20, 1997). "'Bella Mafia' leads CBS to no. 1". Sun-Sentinel. p. 4E. ^ Associated Press (December 11, 1997). "CBS, NBC tie for tops in evening news". Sun-Sentinel. p. 4E. ^ Associated Press (December 25, 1997). "NBC basks in holiday spirit". Rocky Mountain News. p. 18D. ^ Associated Press (January 10, 1998). "Angels and oranges for CBS". Sun-Sentinel. p. 9D. ^ Associated Press (January 15, 1998). "NBC reclaims Nielsen ratings title". Sun-Sentinel. p. 4E. ^ Associated Press (February 12, 1998). "CBS takes gold as Fox flexes muscle". Sun-Sentinel. p. 4E. ^ Associated Press (February 20, 1998). "CBS wins; olympics disappointing". Sun-Sentinel. p. 4E. ^ Associated Press (February 25, 1998). "Prime time Nielsen ratings". Associated Press Archive. ^ Associated Press (March 5, 1998). "CBS last despite Grammys' boost". Sun-Sentinel. p. 4E. ^ Associated Press (March 12, 1998). "WB beats its own record". Rocky Mountain News. p. 9D. ^ Associated Press (March 27, 1998). "'Seinfeld' among comendies that gave NBC Nielsen lead". Rocky Mountain News. p. 46D. ^ Associated Press (April 2, 1998). "ABC rides Oscar to ratings win". Sun-Sentinel. p. 4E. ^ Associated Press (April 9, 1998). "Ball bounces to CBS in ratings race". Sun-Sentinel. p. 4E. ^ "How they rate". St. Petersburg Times. 1988-04-28. p. 14. Retrieved on April 20, 2008. ^ Associated Press (April 30, 1998). "'Merlin' works ratings magic". Rocky Mountain News. p. 14D. ^ Associated Press (May 7, 1998). "'Merlin' magic works again for NBC". Sun-Sentinel. p. 4E. ^ Associated Press (May 14, 1998). "Seinfeld, on the way out, hits its peak". Sun-Sentinel. p. 4E. ^ Associated Press (May 21, 1998). "Seinfeld, on the way out, hits its peak". Sun-Sentinel. p. 4E. ^ "The Final Countdown". Entertainment Weekly (434). May 29, 1998. Retrieved February 12, 2010. 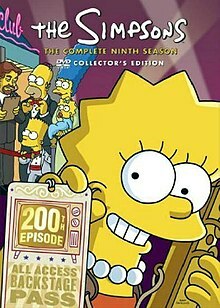 ^ "The Simpsons — The Complete 9th Season (Lisa Head)". TVShowsOnDVD.com. Archived from the original on 2007-10-30. Retrieved 2005-06-06. ^ a b Lacey, Gord (2005-10-11). "Season 9 - List of Extras include Sneak Peak (sic) at the Movie!". TV Shows on DVD.com. Archived from the original on 2007-10-12. Retrieved 2005-06-08. ^ a b c d e "The Simpsons Season 9 DVD". The Simpsons Shop. Archived from the original on April 12, 2008. Retrieved 2005-06-08.